« How Well Do You Know New York? This seems to be an appropriate time to write about St. Patrick’s Day, so I will. Tomorrow is the national holiday of Ireland, and celebrates the life of Saint Patrick, a Christian missionary who lived in the 4th and 5th centuries. It began as a religious holiday, and became a public holiday in 1903. 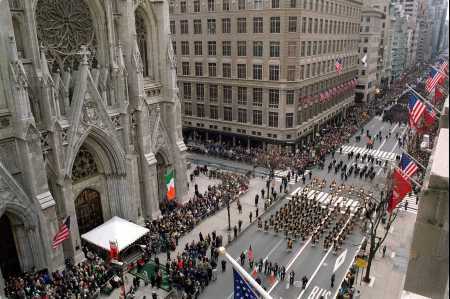 The first St. Patrick’s Day Parade was held in Boston in 1737, but the longest-running and largest parade is in New York, which has run every year since 1762, and today attracts two million spectators and 150,000 marchers. And green is the color of choice, with a river dyed green in Chicago, a canal in Indianapolis, and fountains in Savannah. Even those not of Irish ancestry participate in the festivities (in fact, I’ve gone to several “St. Paddy’s Day” parties in the past few years, and I’ve got only one connection – McCracken – and that name hails from Northern Ireland). So regardless of your background, enjoy! This entry was posted on March 16, 2019 at 4:00 pm and is filed under Observations on the Strange and Unexpected and on Life Itself. You can follow any responses to this entry through the RSS 2.0 feed. You can leave a response, or trackback from your own site.